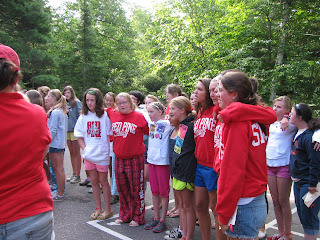 During the waning days of camp, we begin to sing ourselves home...'Five more days of vacation, back to civilization. Back to sisters and brothers, kisses and smothers. Back to boys and news..' And then we lament...'we get campsick,' that yearning for camp and being homesick for our friends. I'm pretty campsick this week, thinking about all my new friends. Counselor friends headed back to colleges like Notre Dame, Indiana University, Princeton, Dartmouth, St. Olaf, the University of Nebraska, De Pauw, and the University of Wisconsin. Camper friends getting ready to start school in suburbs like Lake Forest, Wilmette, Mill Valley, Crested Butte and Denver. Staff friends who will be skiing in Park City this winter, trekking in Nepal and living in Ireland. Good memories and good friends...ingredients to make anyone campsick!